If you seek the online gathering of your brethren, visit now the 3Kingdoms. To join the guild, you only need to ask a Necromancer of circle 25 or above to recruit you. 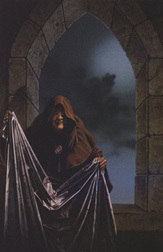 Be sure you have some time to devote to your recruiting process; this is a rich and intricate guild and you must devote yourself to your studies if you want to get the most out of your necromantic powers. Your recruiter should follow through with the responsibility of guiding you through your first few hours (if not more). If you do not feel you were properly initiated into the guild, please notify any of the guild Marquis, Advocate Guild Masters, Legends, or Apprentice Guild Masters. They will make sure the situation is rectified immediately and you receive the training that you deserve.